Party dresses are so over. This season, a dress – however many sparkles it might have – is the beta choice for revellers. Fashionable partygoers will, instead, be sporting the party skirt. OK, dresses are still great and have their place. 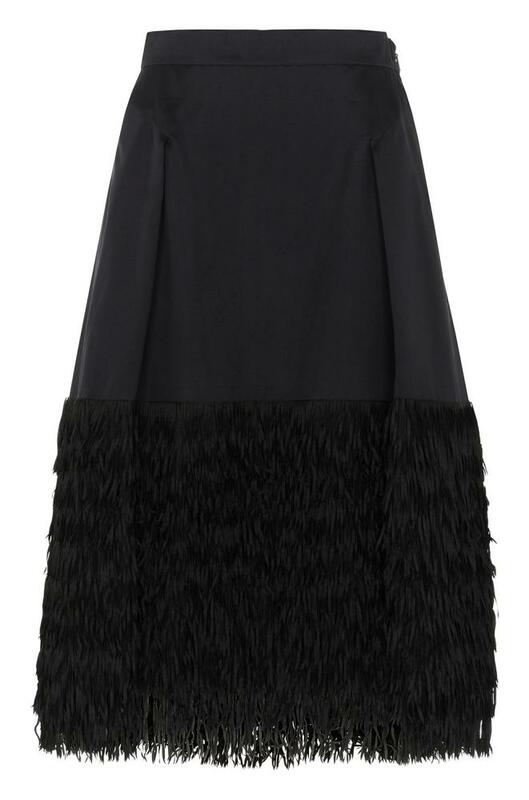 But as we approach Christmas party season, the party skirt is arguably the cooler choice this winter. Because you can wear something else up top, it allows your statement to be understated – the sartorial equivalent of a nice glass of prosecco at the start of the evening, rather than sambucca at 4pm. It speaks of someone who never tries too hard or ends up sent home in a cab before last orders. And because you wear it with something plain (a white T-shirt, a grey jumper, even) it has carte blanche. It can, nay, it should be as ridiculous, sparkly and silly as possible. Although there are bits of it in Raf Simons’ first Dior shows, this trend isn’t really from the catwalk, although it does have roots in the front row power player outfit: a crisp plain shirt with a full, midi-length skirt in a bright colour or big print. (In a way, the fashion front row has the same codes as cool partydressing – dressed up but never OTT – so it’s no surprise). Mrs Prada often wears this at her shows, and style-blogger fodder such as Natalie Massenet, Caroline Issa and Yasmin Sewell wear it all the time, so they’re the references to follow. Or think of it as the reverse of that classic 1990s clubbing look: strappy top and skinny jeans. This kind of half-dressing, as we’re calling it, is perfect for those with fashion commitment issues, because it allows you to look the part, without ever feeling overdressed. It’s also the kind of thing that you can probably get away with at work – add different shoes and you’ll look ready for a night out. As the diary fills up in December, it’s a welcome life hack. You might have a party skirt hiding in your wardrobe – I’ll be digging out a brocade mini that I’ve had for ages – and wearing it with a grey sweatshirt. Or the high street has loads of good ones. A wrap lamé number by Topshop Boutique, or a fringed skirt from Whistles, would be good options, or anything with sequins, such as a green one from H&M. Add a plain T-shirt, “impress me” expression and your effortless after-dark look is here.